As a former anthropology major, I am always drawn to jewelry that has some obvious cultural inspiration. As soon as I saw a photo of Taylor Tomasi Hill in an elongated wire choker, I was instantly reminded of the brass coils worn by the Kayan Lahwi women of the Padaung tribe in Burma. 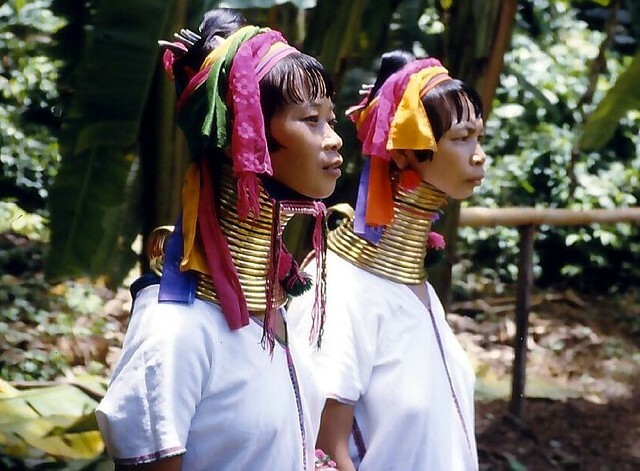 A long, graceful neck like Taylor's is prized here in the west, but the Padaung take this look to the extreme, wearing heavy brass coils around their necks from a young age and then slowly adding to the coils over time until they have elongated their necks to the culture's extreme ideal of beauty. The neck rings don't actually elongate the neck; the brass is so heavy that over time it forces the clavicles (collar bones) down, so the neck appears longer. Modern Padaung still wear neck rings, though it is becoming more common among young girls to choose not to do so. What do you think of this form of beauty? In a less exaggerated sense, like on Tomasi Hill, is this beautiful? In addition to this piece spotted on Taylor Tomasi Hill, tribal influences have been making quite an impression on both the Fall 2011 runways and street style blogs. Mixed geometric and tribal prints appear the be the next big thing (and I couldn't be happier, as that is SO my cup of tea), and woven and beaded bib necklaces and bangles are paired with many of the Spring looks on Net-a-porter. 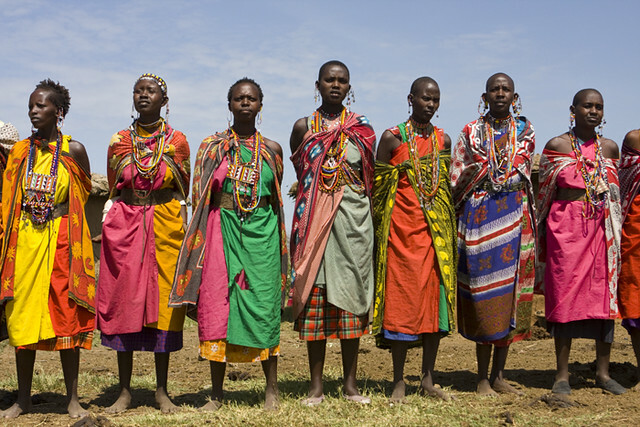 Though Marni and Missoni do a terrific job, might I also suggest looking into Fair Trade Maasai jewlery (Shala Monroque is said to be soon releasing a jewelry collection based on traditional Masai designs). The brightly-colored seed bead bangles and necklaces are all hand-made in Africa and proceeds benefit the education of the women who make them. 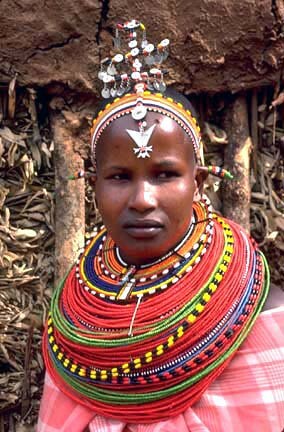 The Maasai have long been an inspiration to me with their bold sense of color and vibrant way of expressing themselves through textiles and their highly intricate beaded collars. See below for a selection of modern tribal-inspired pieces as well as authentic Maasai creations, all of which would be a totally on-trend way to rock some tribal influence in your spring wardrobe. Thanks for the encouraging comment you left, Jamie! Thanks for following. I like this accessories post. 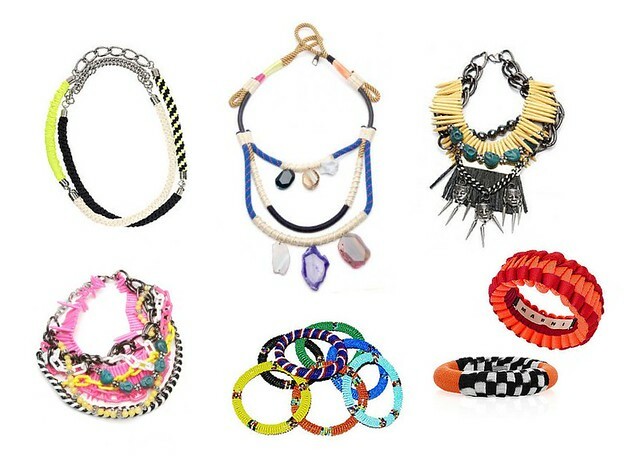 I am obsessing about accessories lately! =) More later.